I was super pumped about this challenge. First of all, album art is one of my favorite things. Seriously. I don't have a record player but I want to buy all the vinyls just so I can have that big, beautiful cover art in all its glory. Also, I love getting my hands dirty, and now I had an excuse. The album I chose was Another Eternity by Purity Ring. If you haven't heard it, stop what you're doing right now and listen to some of it. I'll wait. So here's my concept: I wanted to capture the spirit of Another Eternitywith the techy, futuristic, flying spaceship sounds of the album. I kept thinking about the phrase "another eternity" and the complexity of it. Eternity is something that's unique to life—all the inanimate stuff we make has a shelf-life. It breaks. It falls apart. It becomes outdated. Life is cool because it's something that is continually growing and learning. It even surpasses generation. But how do I make this intangible and organic thing, physical and make it feel like it has a new futuristic life? Silver spray paint. 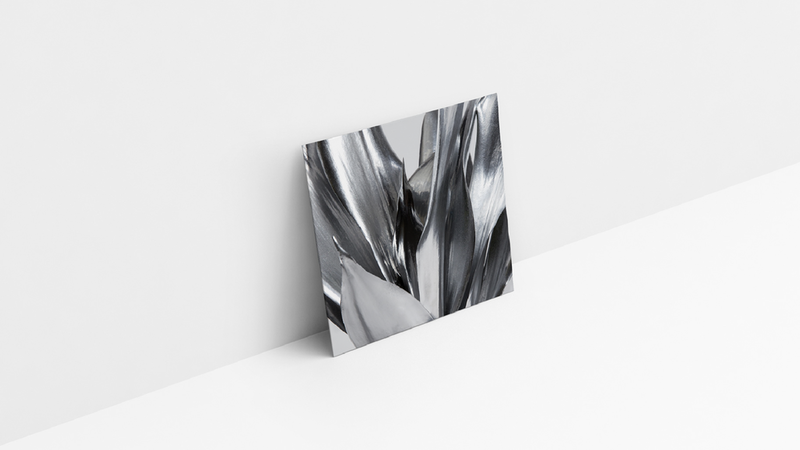 I went to the local market outside of my apartment, bought a snake plant because they have cool leaves, and spray painted it silver and photographed it (with the help of Matty Woodward). I wanted to carry the space-age feeling to the back by making the type feel weightless and floaty. So I turned some stuff sideways and scattered it about like Sandra Bullock and George Clooney after their space shuttle was hit by a satellite.